The Big Bluefish have showed up on the near shore lumps off the South Jersey Coast. 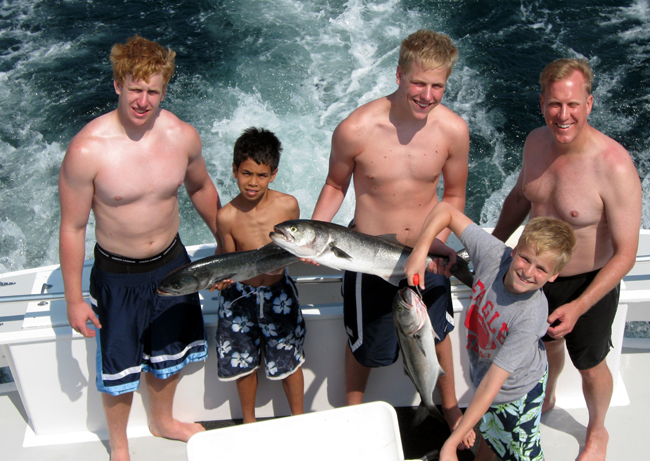 Fishing in New Jersey for Bluefish is a blast for the whole family. Either day time or night time Bluefish trips can be arranged. Often times the fish feed very well on the troll during the day, and better on the chunk at night. The run to the Bluefish Grounds is only 5 to 12 miles off the New Jersey coast. Usually an 8 hr. trip is more than enough time to load the boat with nice Bluefish, here in NJ. New Jersey offers some of the best Bluefish Charter opportunities to be found. Catching monster blues is the fall out of NJ is practically a sure thing. The run to the Bluefishing Grounds is only about 10 miles, and you will likely be able to troll them up with spoons, cedar plugs, and pony tails during the day. Deep diving plugs, work very well on the Blues this time of year, and often there are Striped Bass mixed in with the Bluefish along the beach. Chuming for Bluefish at night, is also very productive at times. The Bluefish often feed like mad during the night and a mad dog bite often can get going in a matter of minutes of setting the chum bag out. The blues can range from small snappers of 1-2 pound up to 15 pounders. We will start bluefishing in May this year with lots of options. Back Bay Trips for the kids offer a mix of bluefish and flounder with our 19' boats in stone harbor, avalon, and sea isle city. Offshore we have 48' Sportfish available for family trips, guys looking to get out for the day, or corporate outtings. Our 48' boat is limited to 6 people.